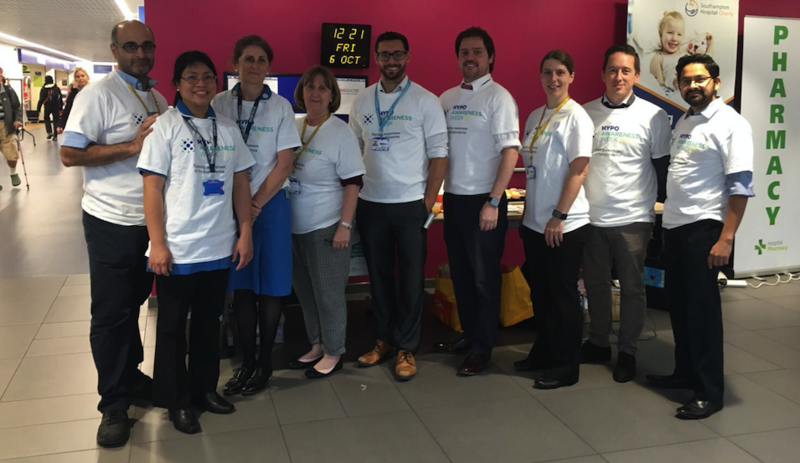 This was the first time this Trust formally recognised Hypo Awareness Week and it was a busy one. They booked a stand in the hospital’s main entrance to catch patients, public and staff throughout the morning and lunchtime period. They had created a visual, eye-catching stand, showcasing hypo treatments and the importance of following this up with long-acting carbohydrates. They said the materials provided by Sanofi were “really useful” and meant that they could give out leaflets regarding hypos to the people they spoke to. Diabetes UK supported the team and spoke with healthcare professionals to see what their knowledge base was like regarding diabetes in hospital. Novo Nordisk brought along their hypo simulator which meant that staff, patients and the public could actually feel what it is like to experience some of the hypo symptoms.